Temple Mount is one of the most important religious sites in the Old City of Jerusalem. Three monumental structures – al-Aqsa Mosque, the Dome of the Rock, and the Dome of the Chain – dominate the present site. I had the opportunity to visit all three monuments. Currently, only Muslims are allowed inside the complex. I knew I may need to “prove” I am Muslim when I arrived. I greeted the guards with the traditional greeting, “As-Salam Alaykum,” which means “Peace be upon you.” They asked me whether I am Muslim as a formality. Finally, a guard asked me to recite the heart of the Qur’an, which is Surah Al-Fatiha. The surah praises Allah and asks for his guidance. I literally said the first two syllables, and the guard waived me in. With its golden, glittering dome, the Dome of the Rock is hard to miss. The shrine, built around the Foundation Stone, is covered in beautiful blue and white mosaics and Arabic calligraphy. Because repairs are being made to the interior of the dome, I couldn’t see the stone itself, but I was able to touch a small portion of the stone around which a nook was built. I also entered a cavern beneath the rock, called the Well of Souls. The Dome of the Chain is a shaded prayer house next to the Dome of the Rock. I actually did not know what it was or its religious and historical significance until after my visit. Al-Aqsa Mosque sits on the southern end of Temple Mount. The silver domed mosque is painted in rich, warm colors, and the architecture and arches are beautiful. I offered prayers and read the Qur’an in both al-Aqsa Mosque and the Dome of the Rock. The sites were peaceful and relatively quiet. I saw families and friends leisurely conversing, waiting for the call to the evening prayer. As I was leaving, I heard the azan (call to prayer) for the evening prayer. I stopped and listened, but I was not able to join the communal prayer because I had to join the rest of my class at Hebrew University. However, I am now motivated to return to Jerusalem, so I’m definitely going back! 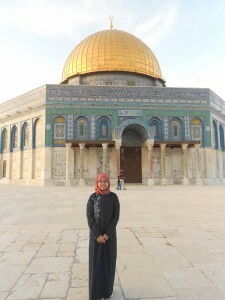 (1) The Dome and the Al Aqsa Mosque are certainly Islamic era structures. (2) The great platform, the Haram esh Sharif, is the work of Constantine the Great. (3) The cave beneath the Rock or Foundation Stone is a grave, only one of many “cisterns” below grade on the Haram. If Sarah was lucky enough to visit the cave, also known as the Well of Souls, then she can tell all her friends that she been inside the empty tomb of the Prophet Jesus.